Last week, UC Berkeley’s Haas School of Business unveiled stats for the incoming students that comprise its full-time MBA Class of 2020. 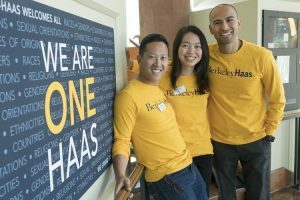 At 291 full-time students (along with 276 evening and weekend students), the Haas Class of 2020 is larger than any before, even as it remains one of the smallest classes among the world’s elite business schools. It is also one of the most academically accomplished classes in the school’s history. Average GPA for this year’s first-year class is 3.66, off just .05 from last year’s. But an increase in average GMAT offset the tiny backslide in GPA. At 726, it moved up one point higher than last year’s incoming class. In terms of professional experience, Haas students come from various backgrounds. About a quarter of the students come from the consulting industry, and another 20 percent come from banking/financial services backgrounds. The industries drawing the third-, fourth-, and fifth-most Haas grads are high tech (10 percent), nonprofit (9 percent), and healthcare/pharmaceutical/bio (7 percent). In addition, 5 percent of the incoming class has military experience. The percentage of women in Haas’s incoming class is also up over the previous year, something we’ve also seen this year at Northwestern’s Kellogg School, Duke’s Fuqua School, and USC Marshall, among others. The incoming Haas class is 43 percent women, a 3-percentage-point gain. International students from 30 countries make up 34 percent of the incoming class, down from 39 percent in the Class of 2019. Here, too, Haas is not alone. Many U.S. schools have shared, in both in published class profiles and informal conversations, that their international application volume was down, or at best, flat year over year. Richard Lyons stepped down in June after 11 years as Haas dean, a role in which he raised more money than any prior dean and oversaw the construction of Connie & Kevin Chou Hall. The addition of the new building helped make it possible to expand the Haas class size, an effort Lyons championed. He and other supporters viewed it as a way to help ensure that Haas has enough graduates to command attention from the world’s top recruiters without compromising the intimacy and culture that makes Haas Haas. In late August, Haas announced that Ann Harrison, a renowned economist and member of the faculty at the University of Pennsylvania’s Wharton School, will serve as Haas’s next dean. Harrison will begin her term on January 1, 2019. Professor Laura Tyson, who has served as interim dean since Lyons left, will return to her prior faculty positions at that point. 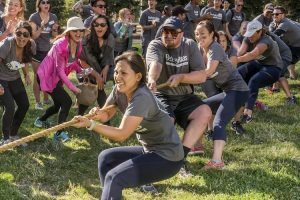 To view the complete Berkeley-Haas MBA Class of 2020 profile, click here.